Shipbuilding Limitedfor 6 new City Class frigates for its Maritime Command. Canada's domestic requirements for security and its NATO obligations. The yard is also active in the new and growing offshore business in Canada. They have delivered an AkerH-3-2 rig to Canadian interests. Support Frames (MSF), modules and steel constructions in general. More than 70 licences in 14 countries, of which 11 are in Norway. Through our pro- duction series we serve the entire Norwegian shipbuilding industry. For 17 years the SRS has delivered system products, shipyard services and ship designs. As early as 1972 we surprised the world by selling Norwegian software to the US government. AUTOKONDATA A/S. 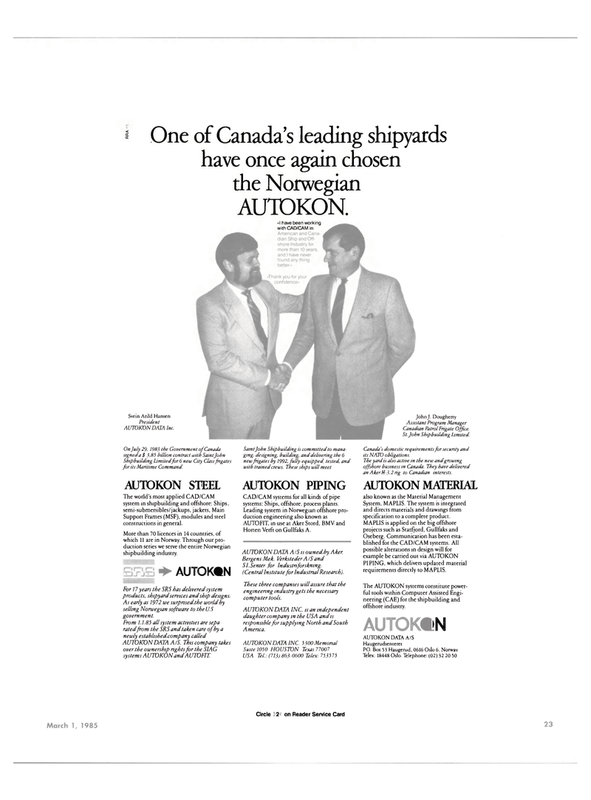 This company takes over the ownership rights for the SIAG systems AUTOKON and AUTO FIT. CAD/CAM systems for all kinds of pipe systems: Ships, offshore, process plants. Horten Verft on Gullfaks A.
AUTOKON DATA A/S is owned by Aker. Sl.Senter for Industnforskning. (Central Institute for Industrial Research). These three co mpanies will assure that the engineering industry gets the necessary computer tools. System, MAPLIS. The system is integrated and directs materials and drawings from specification to a complete product. PIPING, which delivers updated material requirements directly to MAPLIS.